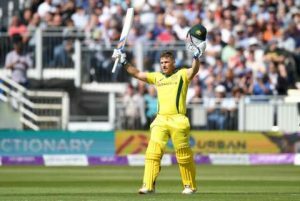 Batting: Aaron Finch 100 off 106 balls, Travis Head 63 off 64 balls, Shaun Marsh 101 off 92 balls, Ashton Agar 19 off 15 balls. Having already lost the series by 3-0, Australia aimed for consolation by winning this 4th ODI against a rampant English side. 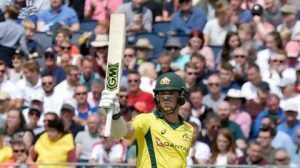 Due to a dry pitch, windy conditions and Australia’s previous losses in the 3 ODI’s Australian captain Tim Paine chose to bat first. 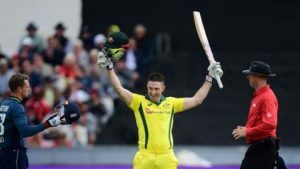 With Maxwell out with an injury and Alex Carey in the squad, Australia sent Finch and Travis Head to open the innings and Mark Wood was given the new ball by Eoin Morgan. Both batsmen started off in a decent manner as Travis Head brought up yet another fifty. Finch also supported him will and the pair brought up their 100 run stand in 19 overs. No wickets so far – and Travis Head has scored this 50 for the Aussies. Adil Rashid was introduced into the attack and he struck in his 2nd over to get rid of Travis Head and give England their 1st breakthrough of the match. Marsh joined Finch. English bowlers serached for quick wickets but the pair stood strong and Finch reached his well-deserved fifty. Moeen Ali was induced into the attack. But, it didn’t matter as the pair brought up the 2nd 100 run stand along with a fifty and a hundred by Marsh and Finch respectively. But, Aaron Finch’s intent to play across the line cost him as he fell to Wood in the very next over. Australia had now lost their 2nd wicket but were still pretty much in control. Stoinis joined Marsh. But, Wood struck in the same over and shattered the Australian’s stumps to give England their 3rd wicket. Ashton Agar was sent up the order. With only 10 overs remaining, Rashid was induced back into the attack. And, the English spinner struck yet again to sent Agar back to the pavilion. Alex Carey joined Marsh. Australia were now 4 wickets down with only 258 runs on the board and only 5 overs left to play. Marsh went berserk as he struck 5 boundaries in 2 overs to reach his 9th overall and 2nd hundred of this series; A brilliant effort. With 3 overs left in the innings, Australia looked to finish strong. But David Willey’s 3 wickets in 4 balls followed by another wicket in the last over denied Australia from a strong finish. With 2 centuries and one fifty, Australia finished their innings on 310 runs. Great innings from Glamorgan’s Shaun Marsh here. Great to see his form for his county being rewarded with a call up to the national team. With England needing 311 runs to win this match, Roy and Bairstow opened the innings and Micheal Neser started off for Australia. Bot openers stepped their foot on the gas from the very first ball and boundaries started coming in every over. This is why Nathan Lyon was introduced in the power play in an effort to get a breakthrough. However, Roy and Bairstow continued their aggressive approach. Roy reached his fify and the two batsmen brought up the century stand in 14 overs. Australia were now looking desperate to break this opening partnership and Stoinis was introduced into the attack. But, Bairstow and Roy were unmoved and added another 50 runs with Bairstow finally reaching his half-century. After a few over, Roy reached his 6th century but lost his wicket in the same over to Nathan Lyon. Hales joined Bairstow. But, this stand didn’t last long as 1 over later, Billy Stanlake took the wicket of Bairstow and denied him another century. Root joined Hales. Both batsmen reduced the target below hundred runs. But Joe Root couldn’t convert his score into a fifty and departed off Agar’s bowling. The English captain Morgan joined Hales. But, his stay lasted only one over as Agar struck again. Buttler joined Hales and simplified things for England as he struck a 28 ball fifty to steer England to victory. With this win, England went 4-0 in this ODI series. 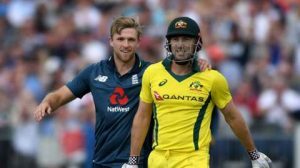 Somehow england proves they invented cricket.. #EngvsAus..
Join Allsportspk on 24th June for the 5th and final match of Australia Vs England ODI series. Previous articleBreaking World Cup 2018 – Argentina Vs Croatia: Who Won…?